Red Clover, Trifolium pratense, makes a cleansing tea. The benefits of drinking a tea of the flowers of this plant accrue over time and include the cleansing of toxins from the body and thinning of the blood. The leaves and flowers are eaten in salads. The cultivation of Red Clover is also very beneficial to the soil. 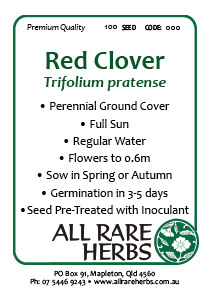 Red Clover is a native of the Northern Hemisphere and prefers light, sandy, well drained soils in a open, sunny position. Flowers are rosy purple to magenta in colour and fragrant. Frost resistant but drought tender. It is a perennial plant, it grows to 0.6m x 1m. Be the first to review “Red Clover, seed” Click here to cancel reply.